Each opening morning of a sturgeon spearing season brings with it a special buzz as spearers approach another season with anticipation. Spearers have already selected a location for their shanty and wonder if this will be a year that a sturgeon swims through their hole. 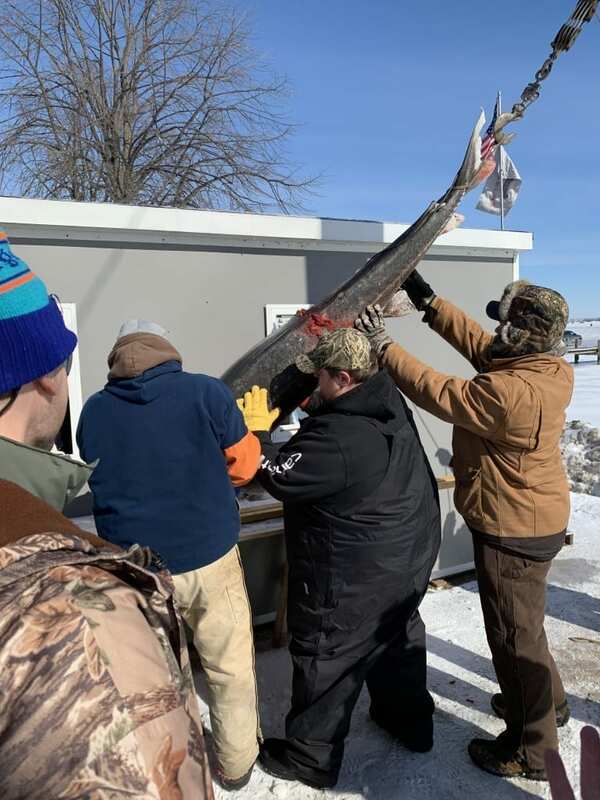 Opening day of the 2019 sturgeon spearing season had an added buzz as word spread of a very large fish harvested from Lake Winnebago. DNR staff working at our registration stations heard of the fish and speculated which station the spearer would come to register the fish at and just how big this particular fish would be. Fish records are tracked by weight and the sturgeon spearing record books were almost completely rewritten between 2004-2013 (Figure 1). There had not been a top-11 heaviest fish registered since the 2013 season, would this fish break that streak? Further, DNR staff had handled fish over the past 10 years that had the potential to break the 200-pound mark, at least when foraging conditions were favorable. Would this fish be one of those tagged fish? Some of those questions were answered at Wendt’s when Jonathan Eiden showed up to register the fish that had created all of the buzz. 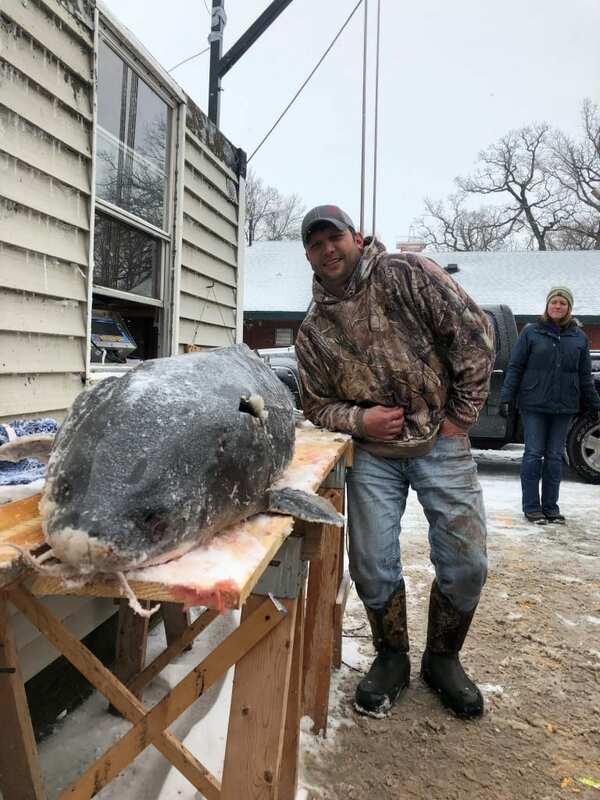 The fish measured 85.5”, which marks one of the longest, if not the longest, lake sturgeon ever harvested from the Winnebago System. The fish weighed an impressive 171.0 pounds, just missing out on the top 11 heaviest fish on record by 0.3 pounds. The size of this fish was impressive enough, but the lore of this fish was just getting started. A scan for an internal PIT tag detected a PIT tag meaning that this fish had been handled by DNR staff at least once since 1999. 1999 was the year that the DNR started using PIT tags to mark sturgeon and this fish had been marked with PIT tag number 454B440753. An Excel search by staff working the registration station indicated that this fish also had a sonic transmitter surgically implanted in her abdomen at some point to monitor her movement. At this point, some questions were being answered, but the story was just getting started. Each registration station calls in their daily harvest numbers to the sturgeon biologist after the 2 PM deadline that spearers must register their fish. While discussing registration numbers with the crew at Wendt’s, I queried the PIT tag number of the 85.5” fish and quickly realized that this fish was not only impressive for her size. She had also been a fish that was the topic of many media publications and a source of discussion during countless DNR presentations and interviews. 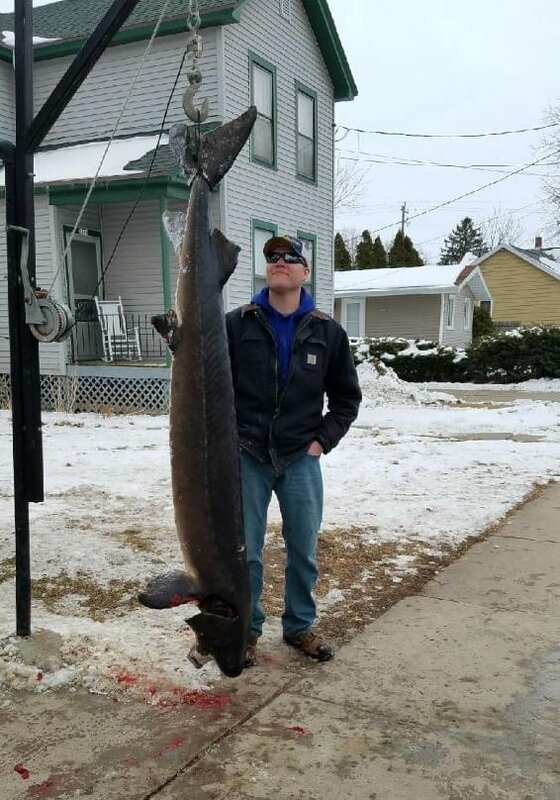 She was the same fish that had been handled twice by the DNR during spring spawning assessments, most recently below the Shawano Paper Mill Dam in 2012 where she was touted as the 87.5” female lake sturgeon that was estimated to weigh 240 pounds before she had started spawning based off length-weight data from previous harvests). This fish had been billed as the primary example of the caliber of fish residing in the Winnebago System and a tangible example of the potential record-breaking fish in the system. We’ve received several inquiries on what contributed to the disparity in the length and weight estimates of this fish between the 2012 and 2019 recapture events. The difference in length is attributable to a couple of factors. First, our measuring boards go up to 84”, so there was a potential error with assigning the length of the last couple of inches. Further, obtaining accurate measurements from fish in spring and winter can be problematic. In the spring, fish are alive and thrashing around which makes it difficult to estimate length. Conversely, fish harvested during the spear fishery are often frozen to varying degrees which can cause the fish to slightly shrink or not allow staff working stations to properly fold the tail down to obtain the most accurate length estimate. The difference of 2” is not out of the realm of possibility for a fish of that size. The difference in weight is attributable to abundance of gizzard shad as a forage item. Eight of the eleven heaviest fish on record were harvested between 2010-2013 and all of these fish were shorter than the 171.0 pounder harvested on opening day (Figure 1). Fish harvested during the 2010-2013 seasons were in excellent condition due to strong gizzard shad hatches in 2009, 2010, 2012. The capture of this fish in 2012 was right in the hay day of fish being in excellent condition, whereas shad hatches in 2017 and 2018 were very weak. This fish was impressive in many facets, but she had the potential to weigh 60-70 more pounds had the last couple of years presented better foraging conditions. As stated earlier, this fish had been previously captured twice by DNR staff and had a sonic transmitter that allowed her movements to be tracked for a discrete time period. 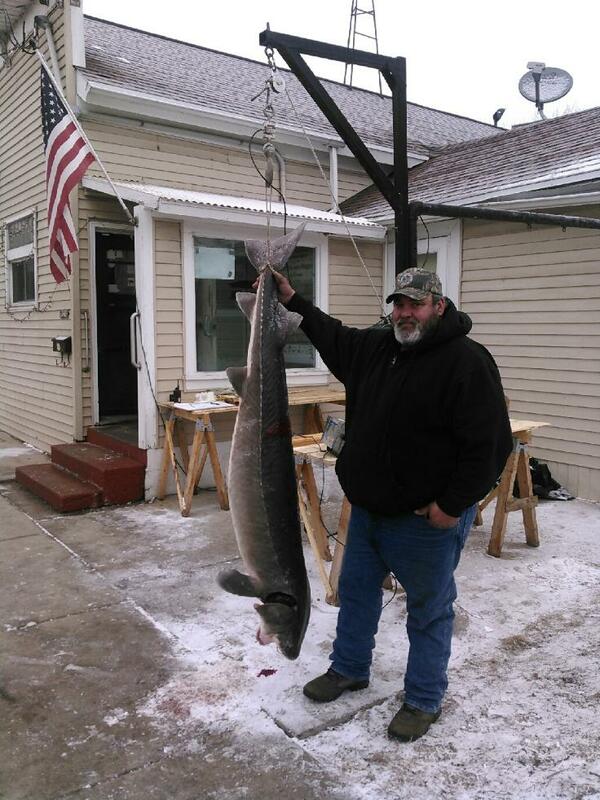 I’d like to take the remainder of this report to present what data the DNR had from this fish. For starters, the fish was first captured below the Shawano Dam on the Wolf River on April 20, 2004. At that point the fish was 84.0” and marked with a sonic transmitter. Sonic telemetry technology was not as advanced in 2004 and the transmitter had a 1-year battery life (tags currently have up to 10-year battery lives). 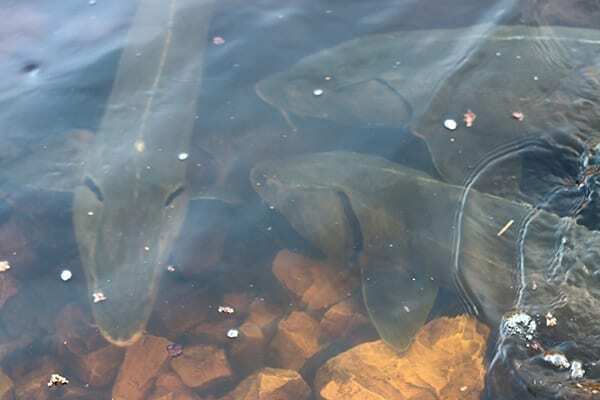 Female sturgeon typically migrate downstream to the Upriver Lakes or Lake Winnebago shortly after spawning, so a 1-year battery life would allow DNR staff to monitor the downstream movement following spawning. At that time there were 18 sonic receivers deployed at locations distributed throughout the Winnebago System tributaries. Most of the receivers were deployed throughout the Wolf River from Hwy M just below the Shawano Dam downstream to the Boom Cut near Lake Poygan. There also were receivers distributed throughout the upper Fox River from Princeton downstream to the Main Street bridge in Oshkosh (the upper Fox River receivers in Princeton, Berlin, and Eureka were not included in Table 1. to conserve space). Each receiver listens for tagged fish and records the tag number (unique fish), date and time of every detection which allows managers to monitor the coarse movement of fish through the Winnebago System. The fish in question remained in the Hwy CCC area (8 miles downstream of the dam) from April 25, 2004 to May 5, 2004. She was then detected in Stephensville on May 16, 2004 as part of a quick movement downstream that culminated with entry into Lake Poygan on May 17. The fish then remained in Lake Poygan or Lake Winnebago until June 2, 2004 when she was detected in Winneconne before ultimately entering Lake Winnebago on June 3, 2004. There were a few detections of the fish in the Fox River (Oshkosh) between October 28, 2004 and November 15, 2004. 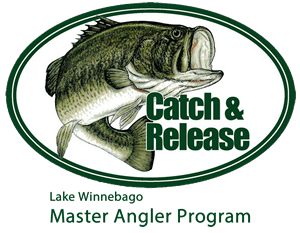 The next capture of this fish was on April 10, 2012 when she was again captured by DNR tagging crews below the Shawano Paper Mill Dam. This was the last fish handled during a very productive tagging data below the Shawano Dam where 559 fish were handled by DNR staff. The fish measured 87.5” and was roughly ½ spawned out when captured by the crew (photo to right). harvested during recent spear fisheries. Displays the number of times the sturgeon was detected on each sonic receiver per date. Following release in 2012, the fish has been at large. 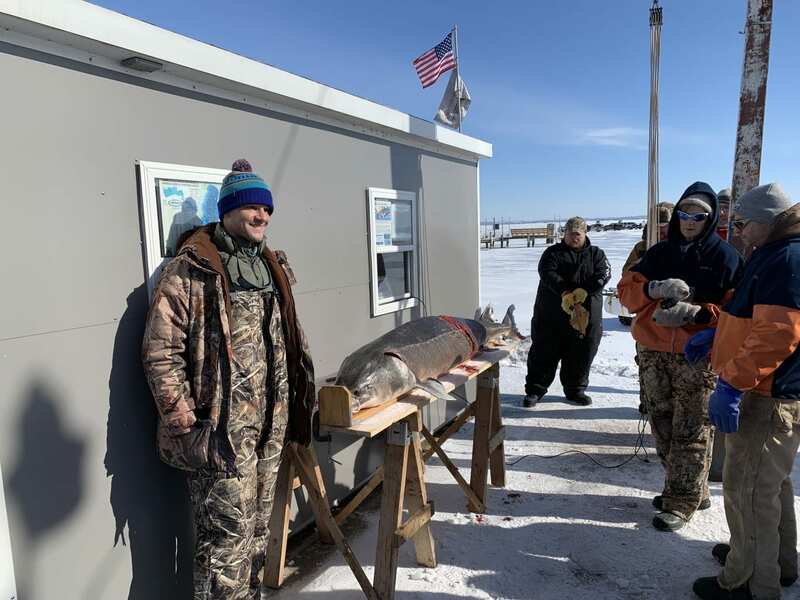 Each season, sturgeon spearers have hoped that she would swim through their hole and each spring DNR fisheries staff hope to see her at a spawning site to collect more data. However, neither happened for close to 7 years until she swam through Jonathan Eiden’s spearing hole on February 9, 2019. Congratulations Jonathan on the fish of a lifetime (photo below)! This particular fish has become very popular since being captured in 2012. In fact, there is a wood carving at Sturgeon Park in Shawano that was inspired by this fish! Further, DNR staff frequently reference this fish as an example of the caliber of fish residing in the Winnebago System. Although this fish is no longer in the population, what she represented still persists. This fish was an example of the big fish that call the Winnebago System home, but I assure you she was not alone. In fact, there have been fish longer than 83” harvested during each of the past three spearing seasons (83.4” fish in 2017, 84.5” fish in 2018, 85.5”fish in 2019). It’s only a matter of time until another sturgeon is captured from this population and captivates the attention and dreams of thousands of spearers and sturgeon enthusiasts!